Instruct’s objectives are set by the Instruct Council and Executive Committee. The Independent Scientific Advisory Board, the Peer Review Committee, the Instruct Centres Forum and user groups all provide advice. 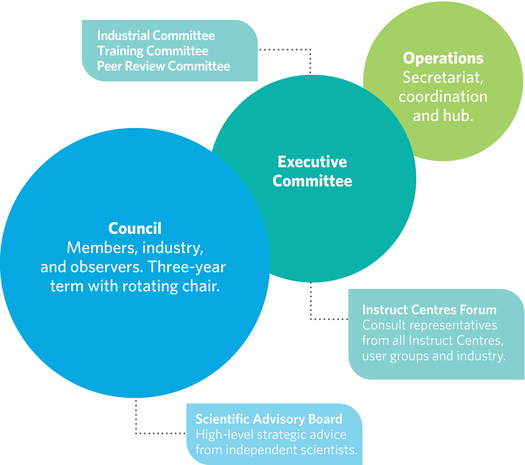 This structure provides all stakeholders, from funding agencies to individual scientists, with the channels and opportunity to shape the future of Instruct. The management and operation of Instruct is delivered through Instruct Academic Services, a not-for-profit organisation. Led by the Instruct Director, it employs the management team and establishes contracts on behalf of Instruct. For more information please visit Instruct FAQ.